I love a day when unexpected good things happen (who wouldn't?). First, C. had a great first day at school. Really great. She'd decided to meet at least one kid in each class, so she did ... apparently she met every kid in every class and she knows all about everyone and everyone's names, basically it sounds like she had a lot of fun. And then I won a yard of fabric on free fabric Friday at Sew, Mama, Sew. Oh my gosh, it was hard to pick just one ... I definately felt like a kid in a candy shop ... and not just any candy shop, but a decadent one with a lot of everything. 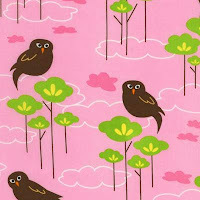 I finally decided on the pink owl fabric, and I love, love, love it. If you've never ordered from them before - DO. Prices are great, shipping is low, and delivery is insanely fast ... like they've shipped your order before you hit "send". And then to top it off one of the kids asked why Daddy and I don't have any wrinkles. Oh I love my kids. Another child later said I was little, in a thin way. While neither statement was quite true, I'm not arguing! Those are some Very Good Things! Love when the day is just busting all over with good karma!